Global experience shows that when parking policy is designed as a travel demand management tool, it reduces car usage, congestion, air emission and fuel usage. Anumita Rowchowdhury, Executive Director of Centre for Science and Environment, writes on these issues and more. A proper parking policy can address mobility crisis in Indian cities where cars are edging out public transport, walking and cycling along with adding to killer pollution and guzzling energy. In fact, a parking policy is included in the transportation reforms mandated under the Jawaharlal Nehru National Urban Renewal Mission (JNNURM). But the cities are still not clear on what the parking policy is expected to do. In the conventional planning process, a parking policy continuously satisfies the growing demand for parking as vehicles grow in numbers. But, as global experience shows, a good parking policy can actually help to reduce the dependence on personal vehicles and can encourage alternative modes. What ails the current parking paradigm? Parking demand is insatiable and entails enormous cost as cars aggressively encroach upon urban space. Parking devours close to 10 percent of urban land in Delhi and the daily addition of cars creates an additional demand for land bigger than 300 football fields. Can any city afford this? This also raises concerns regarding the equity in urban land-use. More land is allotted for one car parking in a multilevel parking structure than is allotted to a low cost housing scheme for poor people. A car needs about 23sqm to be comfortably parked. But a very poor family in Delhi gets a plot of just 18-25sqm. A city can never have enough land for parking but it is always under pressure to divert it away from other important uses. In Delhi, a disproportionately high share of urban land is devoted to parking when only 14 per cent of the daily travel trips are carried out by cars. Free and under priced parking space is a hidden subsidy to car owners. It must be kept in mind that parking incentives induce more traffic. The National Urban Transport Policy (NUTP) endorses travel demand management principles. When combined with priced parking, limit on parking space and improved access through other modes of transport, parking strategies can help to switch alternative modes of travel and restrain car usage. 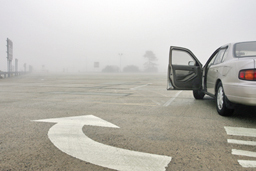 Manage parking well: The first step is always about managing on-road and off-road parking to reduce traffic chaos. International experience shows that efficient utilisation of legal parking lots can increase the parking capacity by at least 20-40%. It prevents illegal parking and frees up space. Cities like Delhi and Pune have begun to demarcate legal parking areas to improve enforcement of policies. Cities are looking at designating on-street parking areas based on the traffic volume of the streets, efficient utilisation of parking lots – valet parking, upgradation of metering, IT application, improved user information and management for spill over. Strict penalty for violation of parking rules, illegal parking and walkway encroachment are important aspects of the entire process. Tokyo and other Japanese cities have successfully implemented stringent penalty for parking violation, thereby pushing up the marginal cost for car owners. For the multi-level car parks, the policies are often based on the assumption that more off-street parking can curtail on-street parking and congestion. But global reviews show that it is erroneous to think that plentiful off-street parking can automatically reduce on-street parking. This can happen only if parking is banned in selected areas. On-street parking always remains attractive as it is most convenient. Additional measures are needed to discourage not only on-street parking but parking on the whole. How much parking is enough? Indian cities have adopted parking standards for different land uses and building types but haven’t fixed a common matrix for defining norms. Delhi specifies parking slots per 100sqm; Kolkata and Pune per 75sqm; Hyderabad specifies a percentage of a built up area for parking and so on. However, Indian cities specify the minimum parking needed. Norms allow individual and private parking that cannot be shared with others. These spaces are not counted towards the allowable floor area.The rigid standards have the risk of creating over capacity in areas that are well connected with public transport. But globally, governments are setting maximum allowable standards, thereby capping the number of available parking lots. In Hong Kong, the office buildings in the central business district can have zero parking as these areas are very well connected with other modes. Residential parking requirements also vary with accessibility of an area. In Netherlands, the parking standards vary based on the accessibility of each location. Indian cities must account for the changes in parking demand with improvement in public transport and accessibility. For instance, – In Connaught Place in Delhi, the parking demand has dropped by 10% after the coming in of Delhi Metro. More cars do not necessarily mean provision for more parking. Delhi, with 115 cars per 1000 people, allows three parking slots per 100sqm in commercial areas. In contrast Tokyo, with 400 cars per 1000 persons, allows only 0.5 parking slots per 100sqm in central business district. As is done in Tokyo and Taipei, parking should be – as far as possible – common and shared and not serve each building individually. This will also help to reduce the development cost of buildings. There is a nascent move in Indian cities to have parking as a car restraint measure. Aizwal in the North-East has made parking availability conditional to car ownership and purchase. The MPD21 in Delhi proposes similar strategy. The Tokyo experience shows that a combination of low parking requirement, parking pricing and putting the onus of finding parking space on the car owners can reduce parking demand effectively. Before Indian authorities get generous with parking spaces, they must assess other potential uses of the space as school, affordable housing or public green spaces. Neighbourhoods with public parking can just park, pay and walk! Price parking – Eliminate hidden subsidies: Indian cities need to price parking effectively to reduce car usage. Global experience shows that appropriately priced parking can reduce automobile commuting by 10-30%, especially if linked with transportation choices. In Shenzhen, China for instance, hike in parking fees during peak hours led to 30% drop in the parking demand. Indian cities need to move towards full cost pricing. The NUTP has said that since land is valuable and parking occupies a large part of it, high parking fee linked to the value of the land must be levied to make public transport more attractive. An assessment of the multi-level car park in Delhi shows that the parking charges should be as high as `39-40 per hour to recover the capital costs of the structures. But the actual rates are as low as `10 per hour. It is improbable that city governments can ever fix the parking fees to recover the land cost, capital costs and maintenance costs of the parking spaces. 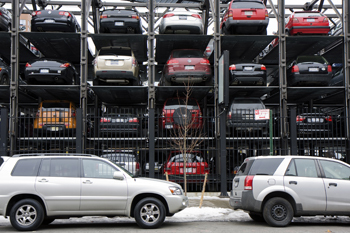 Politics will push for populist brownie points and continue to cap the parking rates. But parking pricing, like the rent, needs to be market driven. It is not the government’s obligation to regulate and subsidise parking fees nor is it the legal right of car users to demand so. The onus should be on the parking operators to recover their costs and profits. The market will find its own level, price will respond to demand and be fixed at a level above the floor price that optimises the use of the parking area. It will ensure that at least 85% of the parking is full during the peak hours. This will force the government to improve connectivity of the locations. Bogota has removed limit on the fees that private parking companies can charge. The increased revenue is used for road maintenance and public transit improvement. Parking revenue for public good: The NUTP has stated that revenue from parking should be used for public transport betterment. This is one of the potential revenue sources for creating dedicated urban transport funds under the JNNURM programme. The government can decide the terms of parking lease and through periodic license renewal, help to enhance the revenue. The parking spaces should be taxed at the same rate if the land was used for other developments. This will also help to offset revenue losses from the other potential uses of the land. Well managed parking and increased/free pricing can help to augment the returns and also maximise the revenue gains to fund other sustainable practices. Parking for multimodal integration: Parking can be creatively deployed for multimodal integration of buses, cycles and pedestrians. Cities like Delhi are developing guidelines for transit oriented development and integration of interchange points. These guidelines are expected to prioritise the parking needs of buses, intermediate transport and cycles followed by cars in the influence zone of mass transit network and terminals. Global experience shows that car parks for ‘park and ride’ on high value land near mass transit stations do not make economic sense and are wasteful especially in dense city core of Indian cities that are served well by good public transport system s.
More cars do not necessarily mean provision for more parking. Delhi, with 115 cars per 1000 people, allows three parkin g slots per 100sqm in commercial areas. In contrast Tokyo, with 400 cars per 1000 persons, allows only 0.5 parking slots per 100sqm in central business district . Leading global cities are using efficient parking management and the travel demand principles to make cities liveable. Even in the car centric US, Boston that was unable to meet the clean air standards, froze its parking requirements at a level that is only 10% higher than the 1973 level. This has helped Boston to meet the federal clean air standards. In New York, very high parking fees and limited parking supply have lowered car ownership far below the average rates in other US cities. Portland, Oregon has set an overall cap of parking spaces downtown. This has increased public transport usage from 20-25% in the 1970s to 48% in the mid 1990s. In Bremen, there is no free parking in the city centre. Parking charges are higher than public transport cost. Globally, customers agree to pay high parking charges if they get good shopping and pedestrian environment. This also improves business. The biggest disconnect with the public in this entire scenario is poor understanding of the multiple goals of a parking policy. The benefits of parking as a travel demand management tool for both car owners and non-car users and environment are not well understood. There is strong resistance to priced parking as evident from the recent High Court case of shopkeepers opposing priced parking in the upmarket area of Khan Market in Delhi. With improved parking management, car users can have more reliable information about the availability of parking spaces and reduce cruising time. Efficient billing makes payment more transparent and accurate. This decreases traffic chaos. Smoother parking reduces social tension, road rage and law & order incidences rampant in cities like Delhi. This can also protect footpaths and allow barrier free walking, cycling & playgrounds and improve access to metro/bus-stops. It will also improve road safety. It can be easier for emergency vehicles like ambulances, fire trucks, police, etc. to reach all homes, offices and buildings. Walkable neighbourhood fosters mixed use, improves green areas, recreational spaces and overall environment. Global experience shows that when parking policy is designed as a travel demand management tool, it reduces car usage and congestion, air emissions as well as fuel use. Next: Building a case for Suburban Park & Ride – Where and how much?